Background: Plants derived constituents with impending therapeutic values have been used long time to cure various diseases and disorders including Diabetes Mellitus (DM). Various restorative herbs have become portion of food as vegetables, spice, and organic products. In current days, there is mounting facts that natural foods molecules, because of their natural possessions, are perhaps inimitable nutraceuticals, possessing additional remedies for diverse characteristics of Diabetes. 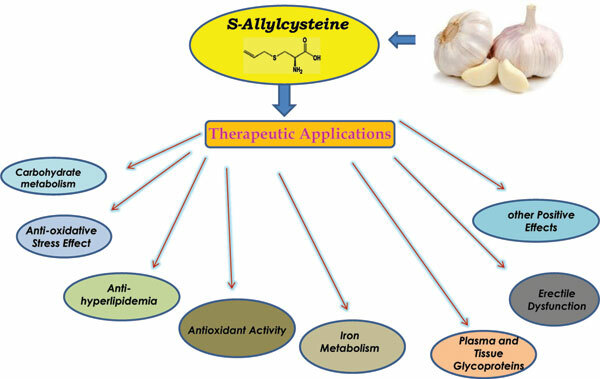 In present appraise, addressed the latent potentiality of a sulfur containing amino acid S-Allylcysteine (SAC), which was derived from garlic on Diabetes mellitus and other disorders. Substantiating with a number of in vitro, animal experiments and some human clinical trails, SAC revise glucose and lipid metabolism, amend hyperglycemia, insulin resistance, and hyperlipidemia, convalesce metabolism of adipose tissue, and oxidative stress development and pathways of stress-sensitive signaling and inflammatory associated issues. Conclusion: S-Allycysteine showed several beneficial effects on various disorders and there is no scientific evidence against S-Allycysteine adverse effects, and proved that consumption of S-Allylcysteine has numerous pharmacological benefits. S-Allylcysteine, diabetes mellitus, antioxidants, metabolic disorders, natural medicines, garlic components.